Here’s a chance to read again one of our old Local History Room columns, first published on 28 Jan. 2012 before the launch of this blog . . .
Pekin has been Tazewell County’s leading community and the continuous seat of county government about as long as Pekin has been a city. But our city had not a few birth pangs in its earliest days, and during Pekin’s first two decades or so the community’s future was often in doubt. 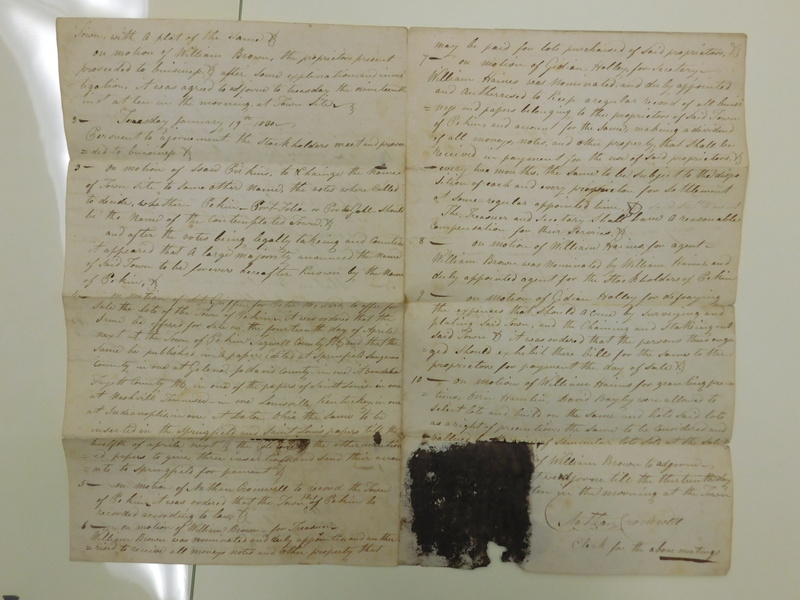 As stated in the Nov. 5, 2011, “From the History Room” column, the 1824 arrival of Jonathan Tharp three years before the formation of Tazewell County was the seed from which Pekin would grow. However, things got off to a slow start, and by 1830 only eight white families lived in the settlement that was given the name “Pekin” that year. Just one year later, however, Pekin suffered one of its many early setbacks, when the county seat was formally moved by the state’s instruction from Pekin to Tremont. Pekin’s Board President J.C. Morgan moved to Tremont at that time and resigned from the Pekin town board on June 27, 1836. Undaunted by the loss of county seat status, Pekin carried on with its annual town elections and its population steadily increased. Calamity struck in late 1843, however, when a scarlet fever epidemic swept over the community, which then numbered about 800 residents. Maus, incidentally, was one of the town’s doctors, and he had attended to the sick during the scarlet fever epidemic of 1843-1844. 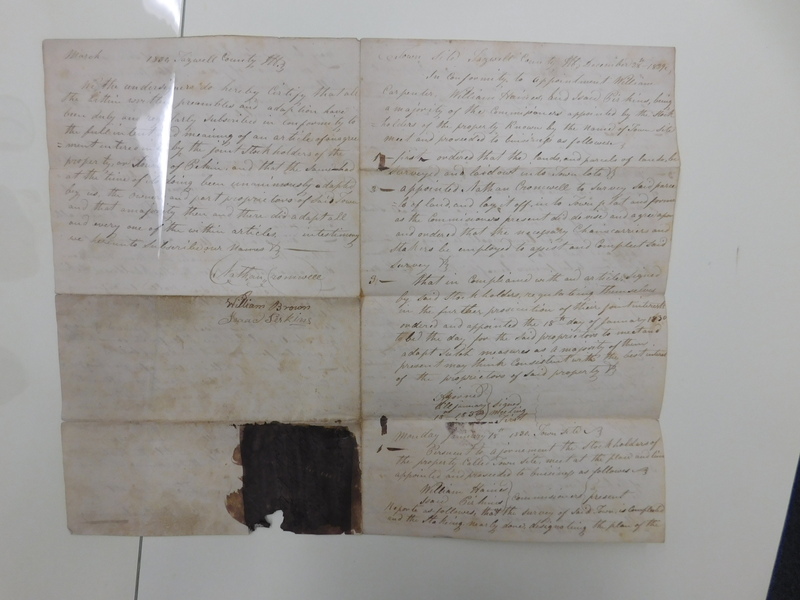 He had previously treated Pekin’s cholera victims during the July 1834 epidemic. In the 1870 Pekin City Directory, W. H. Bates details the process of how Pekin became a city. To begin with, Bates says the county seat was moved from Tremont back to Pekin in 1848. Others say it was 1849, the same year Pekin incorporated as a city, and “1849” is handwritten — perhaps by Bates himself — on the page of the library’s copy of the 1870 City Directory. 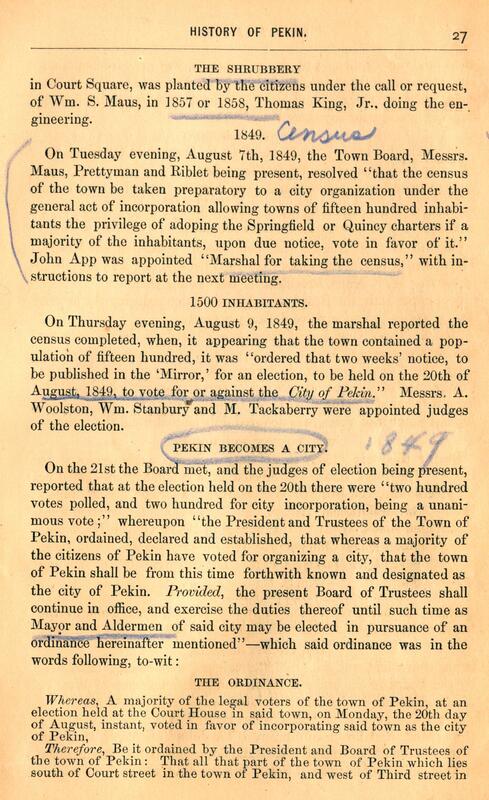 With the unanimous vote on Aug. 20, the “City of Pekin” was born, with a mayor/alderman form of government. Bates says elsewhere that Pekin was only the tenth incorporated city in the State of Illinois. This page from the first published history of Pekin, printed in the 1870 Sellers & Bates Pekin City Directory, tells of how Pekin became an incorporated city of Illinois on Aug. 20, 1849. The handwritten marking may have been added by the history’s author, W. H. Bates, or by a later local Pekin historian.